Shelly moved to the valley in 2014 from Orange Park Florida where she lived for 27 years. She has three children; her son William is living in New Hampshire with his wife Christina. Allie lives in Davis California and Liz is a college student attending school in Bend OR. 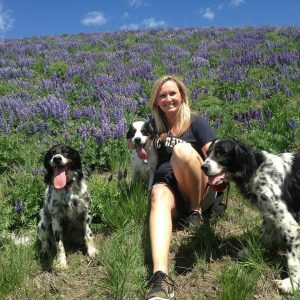 Shelly is blessed to share a home in Hailey with her love Scott Boettger and three amazing English Setters…Biggs a new pup, Moxie age 9 and Maggie age 7. Shelly has been with the shelter for 3 year and is currently the Stewardship Coordinator. She enjoys hiking, walking the dogs, traveling and sightseeing! Most of all she loves to be outdoors!